It's not exactly the worst week in Netflix Instant, but there's nothing that's going to knock your socks off. This week's addition are an odd assortment of films ranging from twisted horror reminiscent of Rosemary's Baby to a sci-fi horror that inspires memories of Event Horizon. In addition, check out Edward Zwick's (The Last Samurai) feature film debut with one of a couple films in this week's choices that are essentially poor man's John Hughes movies. Finally, a comedy that will easily be wiped from my memory if Harrison Ford ends up kicking some extra terrestrial asses in Cowboys & Aliens. So what's in our queue this week? Note: All titles below are not available as of today, but will be soon. Refer to the availability next to each. A story that seems a little too familiar for those of us who have seen Event Horizon and Alien, this sci-fi horror film pits Dennis Quaid and Ben Foster as a pair of crewmen assigned to work on a spacecraft, who discover startling gaps in their collective memory, including who they are and what, exactly, their mission was in the first place. But the real mystery and terror comes when they realize they're not the only ones on board the ship. I smell a sitcom! 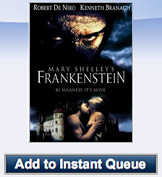 You'd think that Robert De Niro playing Frankenstein's monster would be some kind of "Saturday Night Live" sketch (even Frank Caliendo caught on to the comedy potential), but Kenneth Branagh makes a legitimate attempt both directing and starring as Dr. Viktor Frankenstein in this epic gothic tragedy that attempts to give the classic monster story a Shakespearean level of drama, but falls short of the mark. Helena Bonham Carter, John Cleese and Ian Holm all make appearances for better or worse. Director Edward Zwick (The Last Samurai) makes his directorial debut with this film that isn't entirely unlike John Hughes' She's Having a Baby with the difference being this 80's flick is an adaptation of David Mamet's play Sexual Perversity in Chicago. The story follows two expert singles (Rob Lowe and Demi Moore) who find themselves casually in love until they gradually let commitment get ahold of them and realize that their independence may not be as valuable as letting themselves fall in love with each other. 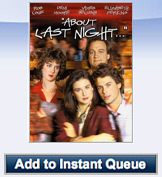 Jim Belushi and Elizabeth Perkins contribute to their relationship as the trusted best friends. The second of two films which strive to be like John Hughes' classics, this ensemble teen drama is like a second rate Breakfast Club all grown up, however, that's not to discredit Joel Schumacher's work because this film has its own charms, strengths and is still a staple of the coming-of-age subgenre. 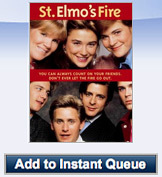 Even Hughes veterans Ally Sheedy, Emilio Estevez, Judd Nelson and Andrew McCarthy appear in this story of best friends and recent Georgetown grads cope with problems like drug addiction, infidelity, unrequited love and restlessness in between visits to their favorite college bar, St. Elmo's. Believe it or not, director Tony Scott used to make films without Denzel Washington and here's the evidence right here as he directs Robert Redford and Brad Pitt in this spy thriller. Nathan Muir (Redford) is on the edge of retirement from duty in the CIA when he learns that his estranged protégé and one-time friend, Tom Bishop (Pitt), is a political prisoner sentenced to die in Beijing. Despite their messy end in friendship (flashbacks give us the context and help develop our characters), Muir takes it upon himself to make one hell of a career's end by rescuing Bishop. If Rosemary's Baby is the appetizer leading to the birth of the anti-Christ, then Grace is the full bloody meal as this creepy horror flick focuses on one of the creepiest, bloodthirsty children ever to grace the screen. 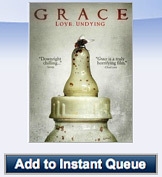 When an accident takes the life of the unborn, eight-month-old fetus inside of her, Madeline Matheson (Jordan Ladd) insists on delivering the stillborn child only to discover that the baby is alive and heinously hungry. Before long, baby Grace spurns milk and forces Madeline to slake her insatiable appetite for blood. This is why I don't want children. 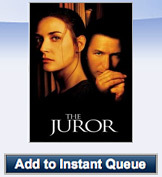 Before Ashley Judd fought off murderers and creepers in thrillers like Kiss the Girls and Eye of the Beholder, Demi Moore was already facing off against Alec Baldwin in the story of a juror (Moore) in an anti-Mafia trial who is forced to play along with The Teacher (Baldwin), a gangster who threatens to kidnap and harm Annie's son if she doesn't convince her fellow jurors to return a "not guilty" verdict. But it seems The Teacher won't let her be even after the end of the trial and Annie's only way to protect herself and her son may be to take on the mob. I'd like to see Moore star in the "30 Rock" inspired sequel The Rural Juror. Even if you hated Kingdom of the Crystal Skull, this buddy cop comedy will make you love even the stupid gophers and slapstick nutshots in that flick as Harrison Ford has never been more desperate as he's paired up with Josh Hartnett to solve the case of a murder of an entire rap group on stage during a concert. This is the epitome of bad buddy cop movies, and somehow it feels like it was made in the 80's at a time when every movie released paired up two unlikely detectives with hilarious results. 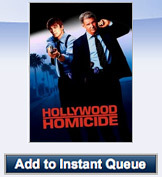 Even calling this movie tongue-in-cheek wouldn't make up for the atrocities captured on film in Hollywood Homicide. And now the best of the rest online free movie websites' new additions for your online viewing pleasure. The Auteurs: Your online cinema. Anytime. Anywhere. Thomas Crown Affair, Forbidden Planet, The Science of Sleep, Amelie, Five Easy Pieces, Sin Nombre, The Girlfriend Experience, Sleuth, Marie Antoinette, Psycho, A Guide to Recognizing Your Saints, The Black Hole, and Choke. Hulu: An evil plot to destroy the world. Enjoy. Guarding Tess, Gandhi, Spice World, and Dr. Strangelove or: How I Learned to Stop Worrying and Love the Bomb. 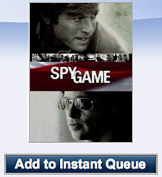 That's all for this week's installment of new Netflix Instant titles and other free movies to check out online. And remember, if you ever want to look back at titles already released, look forward to movies on the way, or check out the entire library of Netflix Instant titles, you can head over to InstantWatcher (in my opinion the most complete listing of Netflix's instant titles, updated daily) or also FeedFliks, whose hawk-eyes are on the lookout for future streaming release dates. And of course we'll also be back next week with the latest line-up of new Netflix titles. Now go watch some movies! Are you satisfied with this week's new selection? 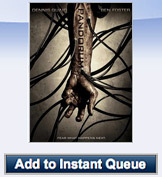 Damn, Pandorum is on netflix instant already? That was fast. I enjoyed Pandorum. Granted it was utterly derivative, but I was fine with that. I love deep space, stasis issues and monsters that rip you limb from limb. Total popcorn flick. Moon however, was a dern masterpiece.